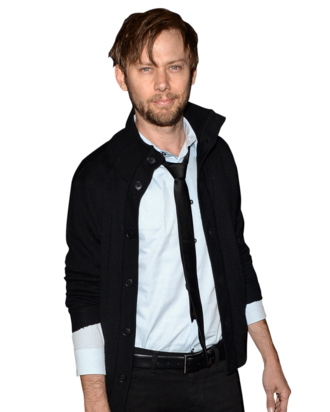 Jimmi Simpson isn’t actually a computer hacker, he just plays one on TV. And in movies. As “hacktivist” Gavin Orsay in this season’s House of Cards, he’s the minimalist dubstep type, helping journalist Lucas Goodwin break into Frank Underwood’s cell phone records. As Skip Tyler in last summer’s White House Down, he was the flamboyant Beethoven’s Fifth type, taking down Air Force One with a single keystroke. Unfortunately, Tyler isn’t as good at bombs as he is CD-ROMs (ha! ), so he gets blown up. Will the same happen to Orsay? We spoke to Simpson about learning the tricks of the trade from Anonymous pros and what it was like working with House of Cards’ true breakout star, Orsay’s guinea pig, Cashew. This is a weird way to start, but please don’t spoil the show that I’m currently interviewing you about. [Laughs.] It’s kind of genius. I love the fact that I can’t talk about stuff on this interview. Obviously, if you’re in a show you know the spoilers, but with House of Cards it’s almost as if it’s in an extra-dangerous territory of spoiling things. I’ve never experienced anything like it. I believe I’ve already seen the kind of key parts of your role, which involves a ton of hacking. Not your first hacker part, either. Most of the people I play are savvy in some technical way, in White House Down and now this guy. The two hackers, [they’re] just two opposite sides of the spectrum. It’s kind of like hacking for dummies in White House Down, and in House of Cards you have characters mentioning Tor and complicated systems that people use in real life to stay undetected online. It was the cartoon versus the reality. It was like playing one for Halloween and being one in real life. You know? Totally. What kinds of research did you do for this? Well, a lot of my research came from two people in particular: My brother has been a hacker since the ‘80s, and my friend Gregg Housh, who is a founding member of Anonymous. Oh my God. What were some of the things that he showed you? Well, “hacktivism” is a term to describe hacking with a purpose, I guess you’d say. There’s an aim and there’s a goal, and it’s not just to eff stuff up. And so with that there’s a certain security — you know where your moral compass is pointed. You might be breaking the law but you’re not trying to hurt people. I know what I’m doing, I know that other people with more power and more control are taking advantage of the little guy, so there’s a certain peace in knowing that the hacking culture has so little to do with just ruining things and making things difficult for other people. It’s actually an enlightened movement. Extremely. Especially talking about Barrett Brown [a journalist who is facing jail time for sharing a link to a hack someone else did; at one point on the show, Orsay asks that Brown be cleared of all charges]. All Barrett wants to do is share what’s going on with the other hacktivists. It’s not about causing trouble, it’s about raising awareness, and I expect that’s why they focused on imprisoning Barrett for sharing hyperlinks that he posted after hundreds of other people did the same. It’s a question between safety and security, and other people are trying to define what both of those words mean. It needs to be a public opinion. We all need to decide what makes it safe and secure on the internet. It can’t be anybody else’s decision. We have to have a voice. I have to hand it to Beau [Willimon, the creator]; he’s acutely aware of the fact that he’s sending messages without even saying it: Look at how crippling this power is to journalism. If you’re going to persecute people for posting hyperlinks, there will be no journalism. If you’re going to persecute people for sharing information, there will be no journalism. Beau clearly is aware of that, and he’s sharing that, and he’s making a part of a television show that we watch for entertainment, but it’s also still true. He’s got such a clear grasp on the world we live in. I wonder what your friend in Anonymous thinks about the ridiculous interpretations of computer programming and hacking in entertainment. Your character, he’s got basically just a computer and a guinea pig, which is one step up from college-dorm behavior. It’s perfect. It’s absolutely commentary on how comfortable a guy who just isn’t exposed to too many humans in the flesh — how much more comfortable he’d be with a guinea pig than, say, a roommate or a lover. Speaking of, how did you get along with your co-star Cashew? We would spend a lot of time bonding before we worked, and he does just the most precious little squeak when he’s happy. I found his favorite spot for rubbing, behind his ear, and we’d be working sometimes, and filming and doing a take, and his squeaking would start coming out because he’s so happy, and then we’d have to reset because Cashew blew the take. The scene when he’s under the shoe? That made me so nervous. Yeah, trust me: That was very safe, but terrifying.